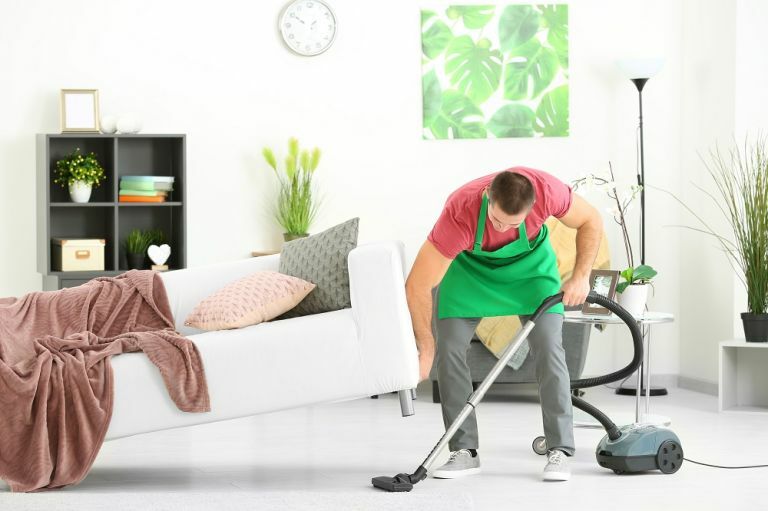 Whether you do a spring clean as a yearly ritual or simply think of yourself as a thoroughly house proud homeowner, it's likely that there are areas of your home you'll forget to clean – and we'd like to wager that we know what they are – mostly because (a quick ask around the Realhomes.com office later...) they're areas we've overlooked when cleaning, too. So, we've updated our spring cleaning checklist to bring you the top 12 places you should never forget to clean (but probably will if you don't read this), and why it's so important to clean them. Take our test to find out what your score is (and let us know on Facebook and Twitter). Love more cleaning tips, tricks and hacks? Don't miss our cleaning hub page – it literally sparkles with inspiration. Light switches are amongst the most touched items in our homes and yet they rarely get cleaned. And it's not that they need that occasional clean when you noticed grubby fingerprints on or on the walls around them – they're actually some of the most germ-packed fixtures and fittings in your home. In fact, 'research has proved them to be covered in both aerobic and faecal bacteria,' says biochemist, Dr Chris Etheridge. Find out more (and ways to get rid of germs and bacteria in the home) in our guide; we've also got a guide on getting rid of mould, packed with handy tips. Mould be gone! Use our best buys guide to find the top rated mould sprays at the best prices. Door handles probably get touched more often than light switches; and kitchen handles and knobs don't just get touched with hands germy from sneezes, for example, but from food prep, too. So, make them part of your cleaning routine and, particularly, your kitchen cleaning routine. What to use? A disinfectant cleaner, such as Dettol All in One Cleaner is the best choice for knobs and handles (and light switches for that matter), but if you want to clean without chemicals, you could use a solution of one part white vinegar to one part water. See our guide to cleaning with vinegar for more natural cleaning tips, and don't miss our kitchen cleaning hacks for more ideas. Use our sourcebook of the best 50 cleaning products to find the right one for the job in hand. Every single member of the household is likely to have the remote control in their mitts at some point during the day and it only takes one of them to have a cold to pass it round the rest of you. Or maybe you're a fan of TV dinners and have got last night's curry wedged into the rewind button? Cleaning the TV remote really does make sense. A quick wipe over every couple of days won't hurt, but to really clean it properly, 'remove the batteries and use a cotton bud with disinfectant to rub around the buttons. Wipe the remainder of the remote with a lint-free cloth,' advise those clean-conscious people at Airtasker. Use our home office cleaning hacks to find more devices that need a regular clean (think: phone, keyboard and much, much more...). Washing the sheets is easy (read our guide to how to do laundry to find the best tips), but don’t forget about the actual mattress that you spend eight hours sleeping on each night. After you’ve stripped the bed of the sheets, use the vacuum to clean all the dust off the mattress. Next, use some bicarbonate of soda and mix with a few drops of essential oils (for example, lavender). Using a kitchen strainer, sprinkle the soda all over the mattress. Leave it on for at least an hour (you can get started on the next thing) and then vacuum with the hose attachment. 'That’s right, these are susceptible to dust too!' say the folks at Airtasker. For larger plants, wipe over the leaves with a moist cloth, and be sure to cradle each leaf with one hand to avoid bruising or cracking them. For house plants that are smaller in size, fill your sink with lukewarm water, support them (and the soil) with your fingers, turn upside down and gently swish their leaves in the water. Why clean house plants? The healthier they are, the cleaner the air will be in your home; the more dust-free they are, the less likely you are to disperse dust around the house as you walk past them (a must-know for allergy sufferers); the less dust there is on their leaves, the less sticky grime will gather (in kitchens and kitchen diners). And what does sticky grime do? It harbours germs and smells. Find out more about how to make your home more allergy friendly in our guide. And don't miss our guide to everything you need to know about house plants to find the right ones for your home. Extractor fans above hobs can get greasy and blocked easily; the best way to get around this is to give them a good clean every now and again. Using a large stainless-steel pot, boil water, and add bicarbonate of soda gradually – stop when you see it fizzing. Carefully using tongs, lower the filters into the pot. Leave them for five minutes, remove, set aside, and wipe clean before adding back into the fan. We'd like to place bets that you clean the toilet pretty thoroughly (you'd never have made it to number 7 on this list if you weren't interested, right)? But how often do you clean behind the loo? Go on, go and look behind yours – if it's anything like the Realhomes.com toilet, it had a gathering of dust balls, bits of loo roll and (we don't know why), the odd hair band. It might well be awkward to reach but it's an easy area to overlook. Our advice? Invest in a handheld vacuum cleaner (see our pick of the best) and a steam cleaner (another best buys guide) to reach those awkward places. We've got more great bathroom cleaning hacks (with more out-of-sight-out-of-mind cleaning spots for you to tackle). Don’t forget about your backyard, it needs sprucing up too! Use a pressure washer to remove mildew and marks from your home's exterior, from your deck and patio. Also, be sure to check all the gutters for leaves that have built up over the cooler months and remove them, too. And don't forget your bins: rinse them out every now and then with the garden hose, and sprinkle them regularly with bicarbonate of soda to get rid of the rubbish smells. They do all the hard work year round, so it's no surprise that your cleaning appliances – think dishwasher, washing machine and vacuum cleaner – all need a thorough clean on a regular basis. We've got guides on how to clean a dishwasher and how to clean a washing machine; to clean a vacuum cleaner, or at least make it smell better, empty it regularly, don't vacuum up food unless it's thoroughly dried, clean the filter regularly with warm, soapy water, and sprinkle bicarbonate of soda into the canister to get rid of nasty niffs. Once you've completed your annual spring clean, give all the equipment that you've used a thorough clean too – after using them to reach every nook and cranny around the house, it’s important to eliminate all the germs that they have collected. The extra bonus is that when you go to use them next time, they’ll be ready and fresh as a daisy. It's one of those jobs you probably know you should do but we'd love to bet that you've never (or maybe once) cleaned your mattress (which might be why it hums like an old fridge, to coin a phrase). So, why not give yours a quick clean next time you change your bedclothes? It's pretty easy – just sprinkle it with bicarbonate of soda – yup, that old favourite – leave, then vacuum off. Unsightly stains on the mattress? Use our guide to find out how to clean a mattress. Removed the sheets and realised the mattress is past its best? See our selection of the best mattresses you can buy at the best prices (thanks to our nifty comparison tool). What....?! (We can hear you say from here.) Yup, lightbulbs need cleaning, too, especially those in a kitchen diner and especially if you're a smoker. Why? Think about it... the grime from the smoke clings to the bulb, dust clings to the grime, it creates a sticky, dirty coating to the bulb, you switch on the light, the bulb heats up and acts like an electric air freshener gone rogue. The result? A smelly room. So, give your bulbs a careful wipe every time you dust. And find out how to get rid of more household smells in our handy guide.